Recent studies boast that a cup of tea is good for us! 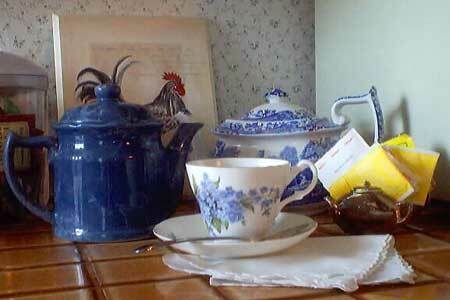 It's fairly safe to say that tea has always finished way down the list of preferred non-alcoholic drinks by most Americans. Coffee, thanks to Starbucks, bottled water and sodas top the charts as our current favorites. But tea, served either hot or iced, is the choice of a growing minority. Green tea has received some very good press lately as a health drink. And as a result the grocery shelves are stocked with dozens of "greenies" these days. But what about the old standbys that tea lovers are most fond of -- like Earl Gray, the Phantom's favorite? And all the rest of the old teabags -- the flavored, spiced and just plain Lipton-type teas that we've enjoyed for years? Must we switch over to the green stuff, which in all honesty, just isn't my cup of tea... Recently on Oprah (fall season of 2004)a tea maven told us that drinking green tea every morning instead of coffee could help in weight reduction. There's even more good news on the horizon. -Bottled tea and instant tea (yuck) have few antioxidants, according to the research. So the next time you can't quite decide what to drink, consider requesting a nice cup of tea. What can it hurt?